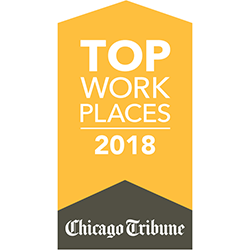 CHICAGO, IL – NOVEMBER 2, 2018 – Advanced Group, a diversified professional staffing, consulting, and outsourcing organization, has been awarded a 2018 Top Workplaces honor by The Chicago Tribune. The Tribune held an awards ceremony at the United Club at Soldier Field on November 1, 2018 to recognize the winners. Advanced Group received special recognition at the event, being one of only 10 organizations to win the award all nine years the program has been in place. The Top Workplaces list is based solely on employee feedback gathered through a third-party survey administered by research partner Energage, LLC. The anonymous survey measures several aspects of workplace culture, including alignment, execution, and connection.